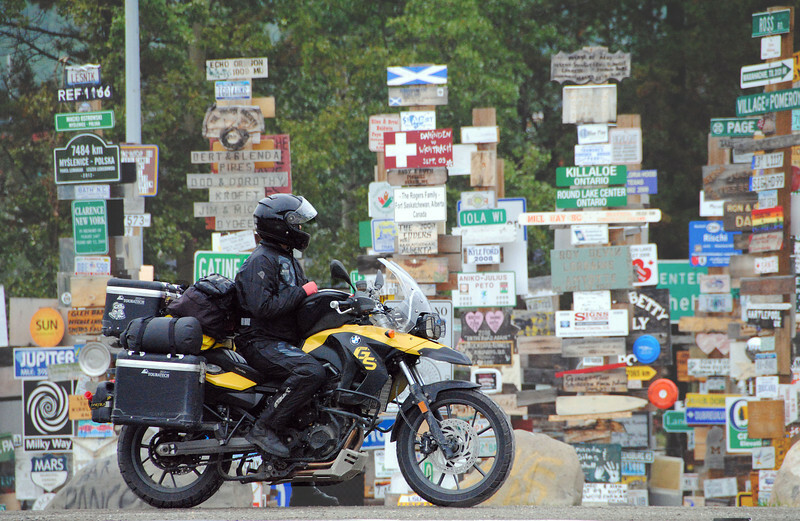 We're now at the north end of the Cassiar Highway, as it terminates at the Alaska Highway. The full name is the Alaska-Canada highway, or Alcan Highway for short, but most people refer to it as the Alaska Highway. The road was originally built by the US Army to provide a way to get troops and munitions to defend Alaska against the Japanese immediately after Pearl Harbor. "The major difference between a Canadian province and a territory is that provinces are jurisdictions that receive their power and authority directly from the Constitution Act, 1867, whereas territories derive their mandates and powers from the federal government." Watson Lake is a small town just east of the Cassiar/Alcan intersection and that's where we decided to camp for the evening. 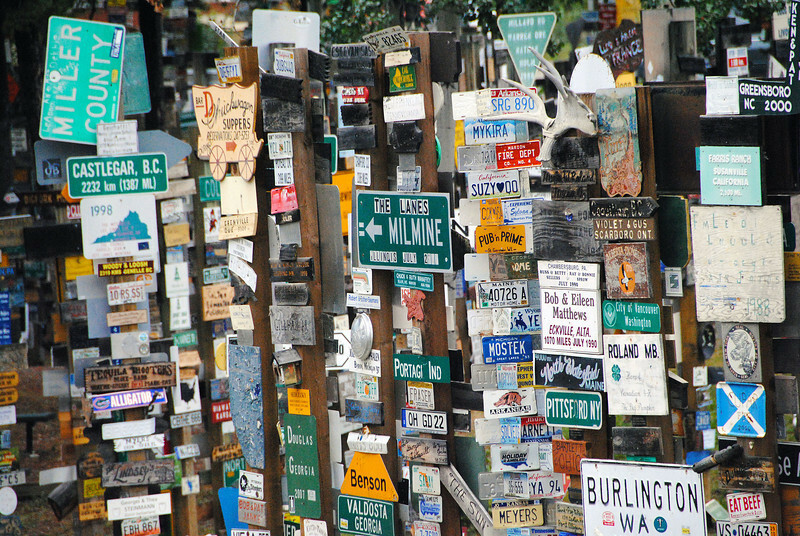 Upon entering the town, we saw an unusual sight: thousands of signs on posts erected on the side of the road. Not just a row of posts, but a whole forest full of them! We got off to investigate. While at the visitor centre, we overheard one of the staff talk to a guest in fluent German! It turns out that Whitehorse, which is the capital of Yukon and only 4 hours drive away from Watson Lake, is quite the hub for trans-continental flights. This is due to a shorter distance for northern hemisphere countries to fly over the Arctic, than it is to fly latitudinally over the fat part of the globe. 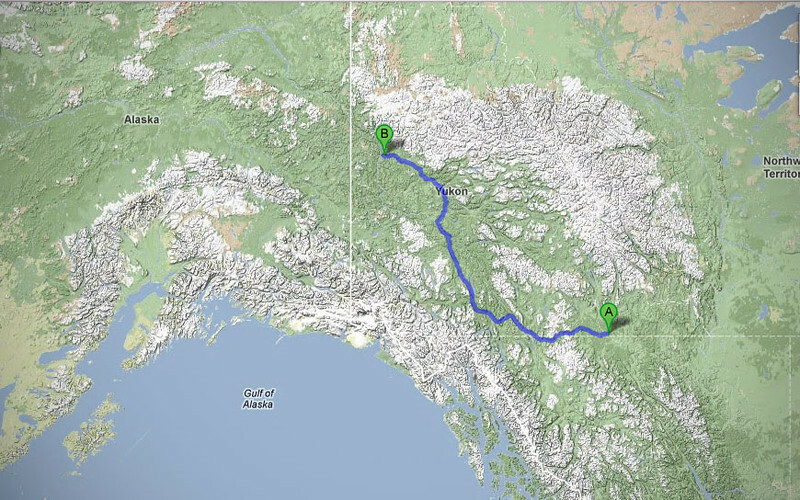 In fact, there is a direct flight from Frankfurt to Whitehorse. 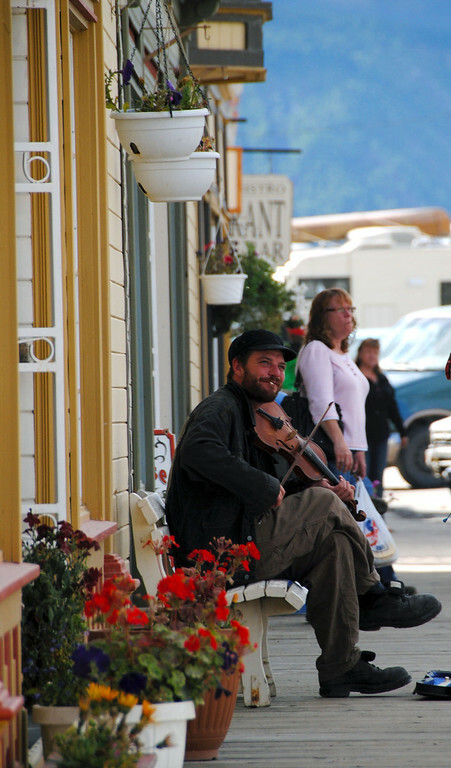 This would explain all the German tourists in rented RVs that we ran into wandering around the Yukon Territory. On the way to Whitehorse, we stopped in Teslin, a small town right on the Alcan, for a break. There we met Young, a Californian who rode his Trumph Speed Triple up here. He had just gotten his rear tire replaced, and he was in Teslin trying to find the local who helped him when he was stranded on the side of the road earlier. Young just left us a note on our Guestbook! Cool! From Whitehorse, we rode the Klondike Highway north to Dawson city, the same route that over 100,000 prospectors took to travel to the Yukon after gold was discovered in 1896. The journey for them was long and arduous and they had to carry everything they needed on their backs. For us, the 500km ride was scenic and our trusty motorcycles carried everything for us. Pretty sure none of these buildings actually existed at the time of the Gold Rush, they were built for the Tourist Rush. 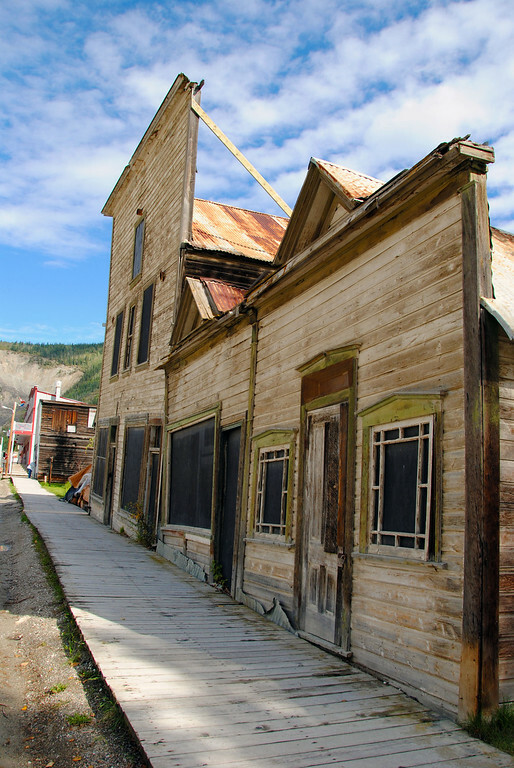 Dawson City is one wild-looking town straight out of all the Wild West movies. There are still some original buildings from the turn of the century, but most of the stores and businesses are built and decorated to reflect the town's rich history. By the time most of the prospectors arrived in the Yukon, most of the gold claims had already been staked so the majority came all the way for nothing. 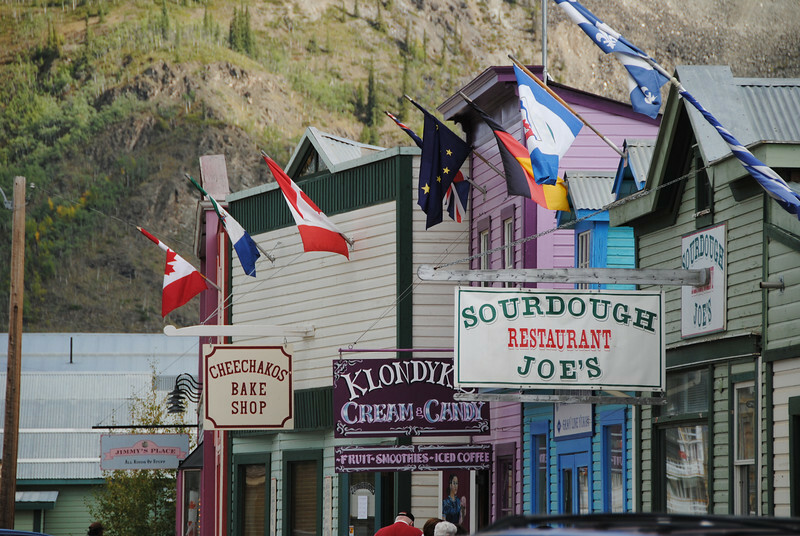 Still, some worked in the mines for companies and started businesses catering to the continuing influx of new prospectors, and this was where Dawson City was born. We treated ourselves to a couple of nights in a local bed and breakfast, it was pricey, but it was soooo luxurious sleeping in a real bed again! During the day, we strolled the wooden boardwalks around town. It was the end of the tourist season so some of the stores were closing soon and the town was not as busy as it was just a few weeks ago. During its heydey in 1898, Dawson City housed so many prospectors and businesses that it was the largest city in Western North America north of Seattle. 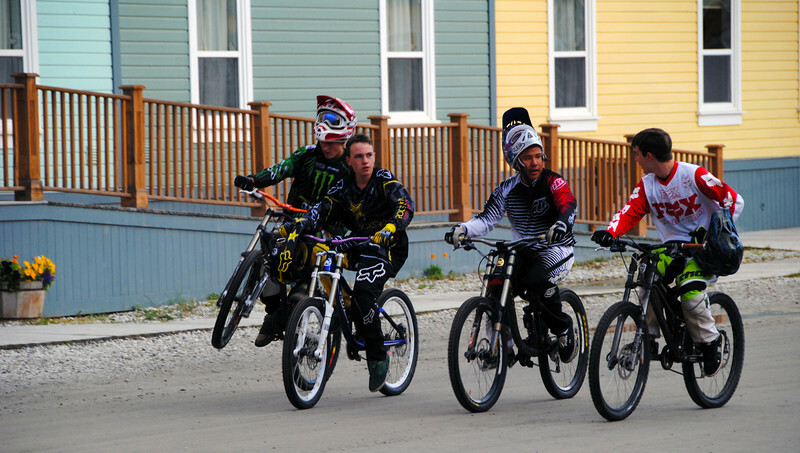 These guys look like they just came from Crankworx 2012! I've been meaning to grow a dodgy-looking 'stache my whole life. After the glitter of the Gold Rush faded and news spread that most of the claims in the Klondike had already been staked, prospectors left Dawson City in droves, some looking for gold in Alaska, others returning home with their pockets empty. 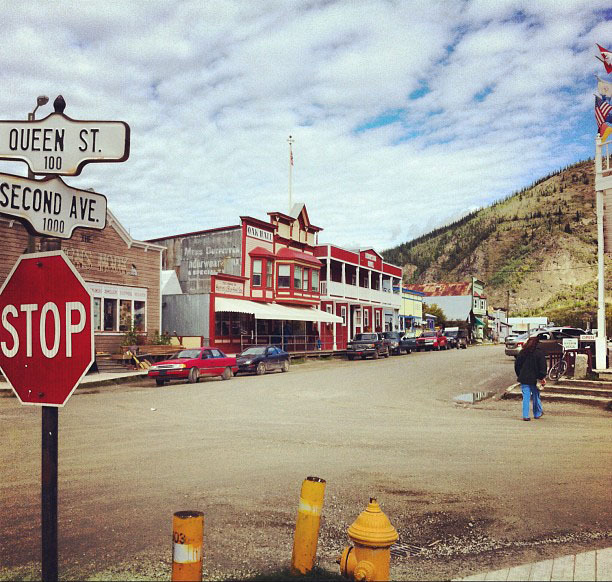 Still, the infrastructure for a large city had been built and over time, Dawson City escaped the fate of several Gold Rush ghost towns. Just a couple of decades later, it re-emerged as a new mecca for entertainment, drawing in the wealthy and affluent on large steamships to spend their time and money here. 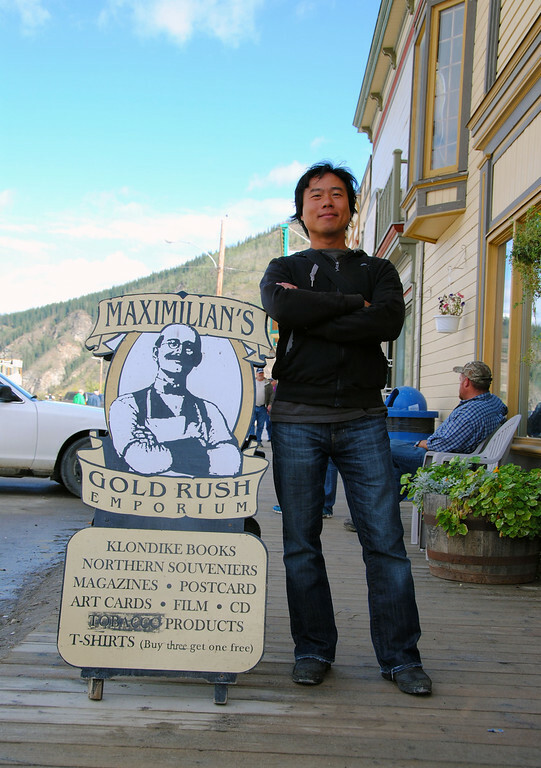 The original buildings were built right on the permafrost land during the summer of the gold rush. However, once the winters came, the warmth of the floor melted the waters of the ground underneath and caused the first structures to cave in on themselves. Later buildings were built on raised supports. 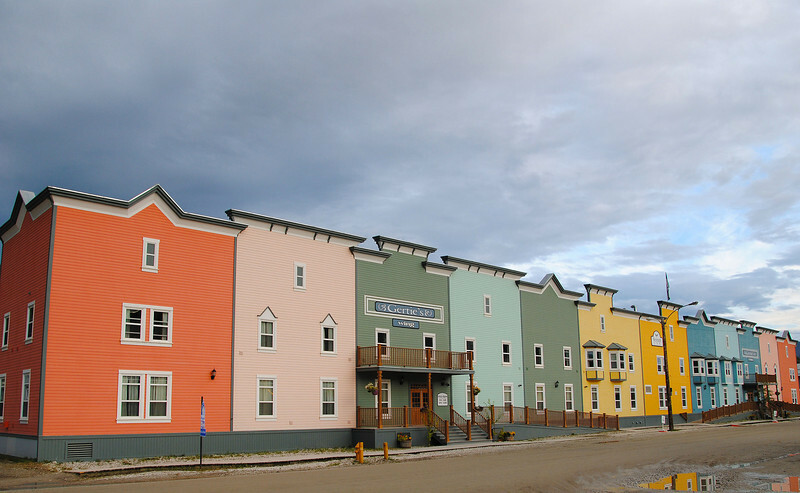 The fake front facades that look like they came straight from a Hollywood set were propped up to mask the cheaply-built buildings behind, as they were hastily erected to service the rush of gold prospectors. 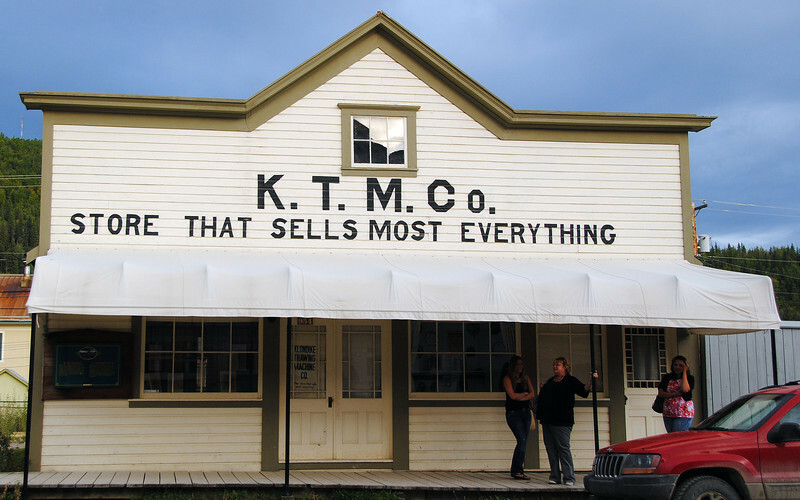 The facades were ornately painted to give a sense of permanence to prospective customers. All the modern tourist stores are built in the same tradition on raised supports and fake facades, as you can see in the pictures above. I can just imagine two gunslingers facing each other at opposite ends of this street at high noon. DRAW! We learned so much about the Klondike and the history of Dawson in the couple of days that we spent there. 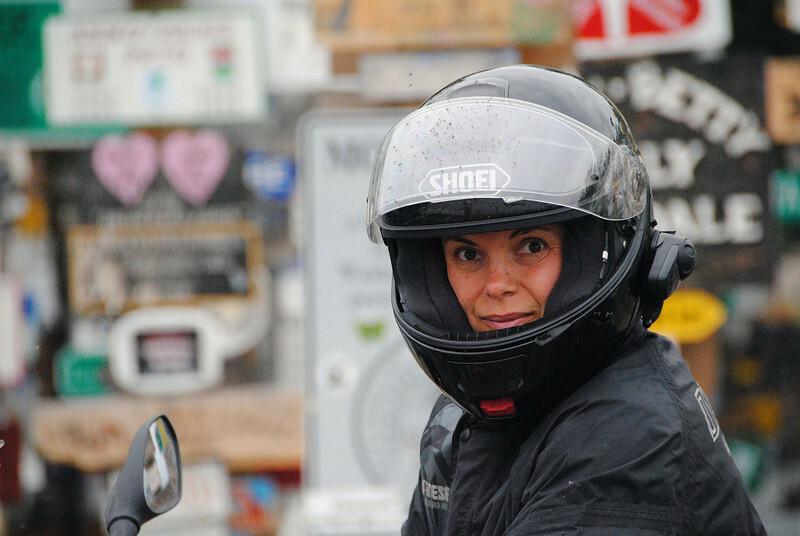 I'm really enjoying this meandering by motorcycle, it's a lot more enriching than just spending the entire time on the road and seeing towns from behind a visor, while missing out on all the culture and history.